In the Channel Island of Guernsey we have a famous traditional recipe that is one of the most delicious things you will ever taste, plus being very inexpensive to make. It is called a Guernsey Bean Jar and all you need are some basic ingredients and plenty of time to cook it, as the longer it cooks the better it tastes. Traditional Guernsey Bean Jar is a bit like a combination of a stew and a casserole, but with much better flavour. Competitions are held frequently to find better and better recipes, and many of these recipes can be found by surfing the Internet. This dish is frequently found on menus within local family pubs and bars and is always a very popular choice. I strongly recommend everyone try making this dish, as I guarantee it will soon become a firm family favourite. 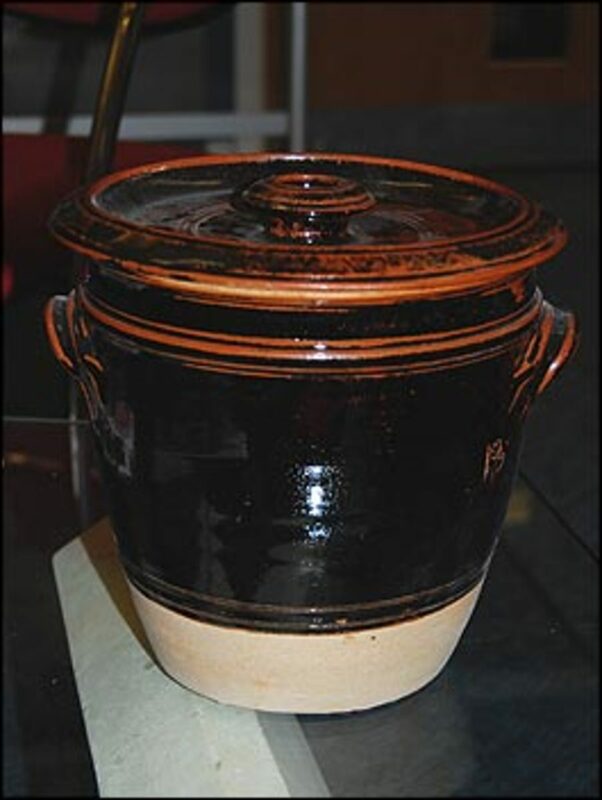 There are two methods to actually cook your Guernsey Bean Jar, so depending on which one you choose, you will need either a large oven crock pot or casserole dish (with a tight fitting lid), or a decent sized slow cooker. The oven cooking usually produces the better results, but the results are also impressive if the Bean Jar is cooked in a slow cooker. In addition to the above you simply need your ingredients and the patience to wait for it to be ready. Approx 500g of dried Haricot and Butter Beans (plus extra if you are following the Top Tip at the end of the recipe). 1 decent sized pork hock with fat on and bone in, (you can also use a pigs trotter instead). 1 beef shin with bone in. 2 or 3 average sized carrots. 1 or 2 large onions depending on size of your crock pot or dish. A French Stick loaf and Guernsey butter to serve iwith it. 1) First cover your dried beans in cold water in a pan and soak overnight before rinsing thoroughly under running water. 2) Place a third of the soaked beans into the bottom of your casserole dish. 3) Peel your carrots and onions and dice into relatively small pieces. 4) Add a third of the diced vegetables to the beans already in your dish. 5) Place both the pork hock and the beef shin on top of the bean and veg mixture. 6) Add the rest of your vegetables and beans on and around the meat in the dish. 7) Add your tablespoon of mixed herbs, (or more according to taste). 8) Add approx a teaspoon of pepper, (or more according to taste). 9) Cover the contents of your casserole with water and crumble the stock cubes into the dish..
10) Do not add the salt until the last hour or so of cooking time or your beans may stay too firm. 11) Depending on which method of cooking you have chosen, either bring to the boil on a high heat in the slow cooker or in your oven, before turning the heat right down to very low (approx 120 degrees Celsius). 12) Allow to cook for an absolute minimum of 8 hours, although I prefer to leave mine cooking for closer to 12 hours. Every now and again check the dish to make sure there is enough liquid and top up if necessary. 13) Remove the meat carefully from the dish and then remove the fat and the bones and discard before returning the meat in small shreds or pieces to the other ingredients. 14) Now is the time to add your salt (according to taste). 15) Return your casserole to the oven or the slow cooker and leave on for a further hour. 16) Butter slices of your french bread stick and serve the Guernsey Bean Jar in soup bowls or deep dishes along with a spoon and several slices of the bread. Top Tip: Soak and boil extra beans in a separate saucepan to add later as a thickener or to replace beans which have broken up during cooking. You will find this recipe is mouthwateringly moreish, and if you fail to empty the casserole dish on the day it is ready, it tastes even better on day two. My only warning, beware of a 'windy' time afterwards due to the beans, and don't worry if your friends avoid you for a day or so after eating it because of this side effect, they will soon be converts themselves if you give them a taste of your Bean Jar to try too. Thanks Ray, not sure how well it will work out with belly pork as the true depth of flavour in a bean jar comes from the bones, and there is simply not enough bone in belly pork (if any in some cases). Cannellini beans are not something I have tried in a bean jar before, but I did taste a bean jar once where someone had actually used a small brown/red bean (not a kidney bean), and I have to say it didn't taste like a Guernsey Bean Jar, it just tasted like a pork stew with beans in it (and not nearly as nice). For best results use a pork hock (more meat than trotters) and a beef shin to maximise flavour (both are most easily sourced from a butcher as many supermarkets don't have these for sale). Haricot beans are readily available in every supermarket, so next time you should try those combined with butter beans for best results. Hi Cindy, i came across your posting, as I'm just about to make my first Guernsey Bean Jar. (Appalling admission), as I loved it as a kid growing up in Guernsey and my grandmother used to make it all the time. But since moving to the UK over 30 years ago, I have never actually got round to trying to make it myself. So high time to put matters right :) I've not got any haricot beans, so hoping that cannellini beans will do instead. I've been soaking my butter beans overnight, and have pork belly strip in place of trotters, but might make a trip to the super to see if they have beef shin to add to the Creuset. Hi Malcolm, thanks for that recipe, it sounds great. You make a good point about the 'Traditional' part. I can only suspect that over time the best flavour resulted from this combination, and so these became the preferred ingredients of choice. This would mean that eventually it would result in it becoming the recipe known as 'traditional' because it was the one used most frequently (plus the ingredients were quite possibly the cheapest ones available for poorer families). Time passed the family "mum" had her own recipe (probable varied from week to week), which they put in their "Jar" and took to the baker on Saturday, to be collected the following morning for Sunday Lunch. Each jar had it's label on and I am sure that each jar was different - "What is "Traditional" ? Once more “into the fray” after dropping the “bombshell” a couple of years ago - “carrots in a Bean Jar !!!!!!!!!!!! Have always know them included - since my very first”bean Jar” in 1947 (made very traditionally from an old Jersey family recipe). When I moved to Guernsey in the early 60's – there they were, just the same. As you said - use the vegetables left over in the cupboard - just like that which is all the rage at the moment “Potato Peal Pie” (Cinematically, that is !!!!) Am a little puzzled by your vegetarian contributor - R (Richard ?) Le Prevost - surely he doesn't eat a true bean jar with all that meat !!!!!!!!!!! Which leads me on to my “cheat veggie” recipe, which I made recently for some “Veggie Visitors”, in my new bean jar that I brought back from Guernsey at the end of last year. A beautiful one made by Tim Babbé, bought from the Coach House Gallery. It's another “bomber” !!!! “Tinned Beans” !!!!!!!!!!!!!!!!!!!!!!!!!!!!!!!!!!!!!!!!!!!! - but it only takes two hours to make ! It is a very easy, trouble free thing to do and leaves you free to join in the party! LOL CabbageMS, I just can't help finding it amusing that someone would go to the trouble of breaking into a competitors house and 'spiking' their Bean Jar with carrots, although stranger things have happened I guess. That is an interesting fact Matt, I didn't know that one. I live in a Western Parish and enter vegetables in the West Show each year, but never saw anything in the rules about carrots in the Bean Jar not being allowed. Personally I prefer to eat my Bean Jar rather than entering it in competitions, but I do include the carrots. The people who taught me lived in St Andrew so not sure whether officially that was a carrot or carrot free zone lol. On the carrot note - The northern parishes such as vale, use carrot, the southern parishes do not. That is why the west show does not allow carrots in its bean jars during it's competition. Mashing the beans - Personally I wouldn't, I actually strive to stop them mashing up during the process of cooking. Wow, hi Steve, yes I remember Lisa well. We were at Les Beaucamps together and all hung out in the same group of friends, then she got transferred to the Grammar School. A really lovely girl, and I often wondered what happened to her. I also remember Mum talking of Dave Arnold and of course the summer seasons of the 60's. As you already know, Syd James was my Dad, although he died when I was 16. I only caught the tail end of the shows sadly, although I do remember shows at The Wayside Cheer Hotel, The Hermitage, The Carlton and The Whitewoods. I even remember Paul Daniels at the Wayside Cheer and he had shoulder length hair lol. Happy days. Do give Lisa my love won't you. (my name is Cindy). Just loved this thread. I use your version as a base for my own recipe. Your right to say that there is no real rule on bean jar as each family have their own preference when it comes to the ingredients. An experimental recipe of my own was to add a whole scotch bonnet chilli. Remove this at the end of cooking. It adds a fantastic warm zing without taking the roof of your mouth off. Some love it, some hate it but I guess that's bean jar. I remember hearing tales of Syd James. The shirley bassey story story sticks in my mind from my father Dave Arnold who did summer seasons in the 60s and probably my sister Lisa from your youth? I might try that Rob, it sounds rather good. Do you use the Guiness instead of water or as well as? Hi R. Le Prevost. You are right to say "Throw the water away" after soaking the beans, I do this too. No, you aren't supposed to boil the beans first from everything I know, (this ruins their ability to absorb the flavours of the liquids produced by the meats cooking). The beans will boil whilst cooking and this is the correct way to cook a bean jar. You could mash come of the beans to thicken the bean jar, but you must make sure you put in enough to ensure that by mashing you don't appear to leave the bean jar "lacking" in beans. As for the carrots, well, they do add flavour and every bean jar I have ever eaten has them in it, (after all, without them all you have is beans, onion and meat, which is never going to taste as good!) Personally I don't use celery, although I have tried it and it is good, plus I know other locals that do. I have even heard of leeks being used, (but have never tried this personally). Actually if you really want to be totally true to the tradition, there is no official recipe, as originally anything left in the kitchen was used, whatever veg etc was available, (I know this because I used to visit an elderly true Guernsey couple who were here throughout the German Occupation etc, As true Patois speakers etc, they regularly taught me loads of Guernsey traditions and fed me their home made bean jar on a regular basis when I was growing up). Also a tip - rather than add cornflour to thicken it up, just mash some of the beans with a spud masher. Carrots in beanjar is just wrong. And I speak as a vegetarian. And as for celery - WHY WOULD ANYONE DO SUCH A THING? Thanks Neil, I am sure you will be making it for many years to come. Really glad you made it over for Liberation Day, hope you saw all the vintage vehicles on parade too. stayed a week in guernsey from the 8 may for liberation day and during the week we had beanjar it was wonderful,so thanks to your recipe we can now enjoy it on the mainland. Who can forget Syd James - an "insitute" of Guernsey Summer Theatre !!!!! Delighted your Bean Jar went down well Malcolm. I shall definitely look up your music site too, (my Father was the impressario Sydney James here on Guernsey during that era). Depending on your age you may well remember the cabaret shows he used to put on every summer season here on the island, and some of the acts he brought over such as Shirley Bassey, The Rolling Stones, Freddie and the Dreamers, Little and Large etc. Started making it on Thursday - lunch today with friends. As you say - beef or pork is better, but I had the shoulder of Lamb which needed using up !!!!! Went down well though, with my French friends ! Just got one in the oven !!!! Though this time I am using a small shoulder of lamb (it just went out of date in my local shop, here in Béziers, in the South of France. Here, there is a similar dish called "Cassoullet" - not the same though !!!! Just ordinary tiny Haricot beans - no onion, carrots etc. - just fatty meat and beans. Will be interesting to see how a lamb version turns out !!!! Recently in Guernsey and had "Bean Jar" at the Imperial - there speciallity - dreadfull !!!!!!!!!!!!!!!!! Oh Misty ~ how I long for some Beanjar - thank you so much for this. You've made me homesick and it brings back memories of the Battle of Flowers down at Sausmarez Park; and also memories of Ormer Stew and Guernsey Gauche ... great hub, thanks so much! Hmm, I shall have to speak to my Mum on that one izzy, and a few of my locally born friends. Guernsey Gache is the closest that springs to mind, as this is like a kind of Currant bread and delicious with butter, but I am not sure if it counts as truly an appetizer, and I definitely wouldn't call it a desert. Leave this with my and I shall post back here with a link to a separate hub article if I can track down the kind of recipes I think you might be able to use. In Portugal we have a very similar dish. I am in a group that presently is studying the Guernsey culture. Would anyone share Guernsey recipes for appetizers and desserts? I thinks it's wonderful that you have kept some of the Channel Island history alive by putting up the original bean jar on the internet for us all to share! I am originally from Alderney and now live in Australia. I remember the wonderful taste of the "Alderney Bean Jar" very vividly. However now I make the quick version with pork, bacon, tin of butter beans, celery, onion, carrot &amp; stock with a little flour for thickening. Cook for only 2.5 hours in oven makes a lovely casserole for the family. A word of warning though, the side effects are lethal. Your duvet will hit the ceiling! I look forward to your feedback ASHWINSPGA, I am sure you will love it as few people don't.